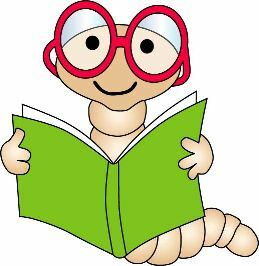 Old Testament - Second Samuel 7 today is a big chapter! God essentially establishes a covenant/promise with David. 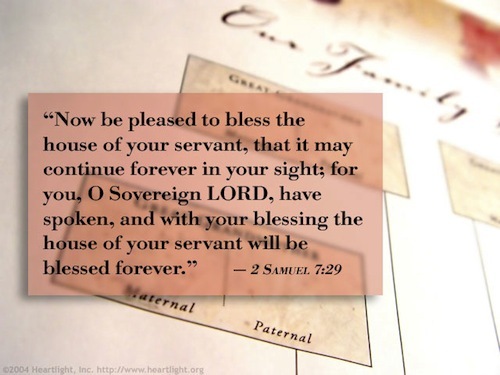 Verse 16 is a nice sum-up of God's promise to David: "Your dynasty and your kingdom will continue for all time before me, and your throne will be secure forever.'" The throne is secure forever because from the lineage of David comes Jesus. Jesus is forever. Genealogies in Matthew 1 and Luke 3:21-38 will give you more details on this lineage. It is interesting that God does not want David to build him a temple, but lets David know one of his descendents will in verses 12 & 13: "For when you die, I will raise up one of your descendants, and I will make his kingdom strong. He is the one who will build a house--a temple--for my name." We will later learn the reasons for this in 1 Chronicles 28 verse 3 when David says - "But God said to me, 'You are not to build a house for my Name, because you are a warrior and have shed blood.'" David was a warrior - as is very evident in Second Samuel 8 today. David's purpose was to unite and establish Israel. 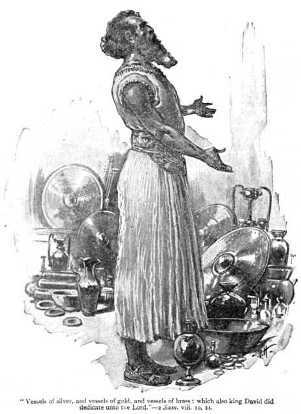 David's son Solomon will build the temple for God. Also, a commenter on this blog in the past made this strong point: "The building of a temple for God is not referring to Solomon but still to Jesus Christ. The true temple of God is the Church of Jesus Christ. 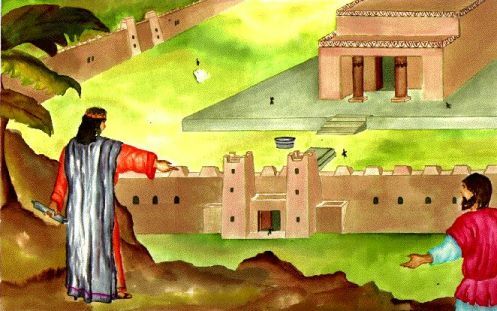 While the Israelites have tried to build God a temple it has each time been destroyed. Only the Church of Jesus Christ is able to stand for all time. While it is true later Solomon does build a temple I believe this passage is still referring to Jesus and the church he builds." 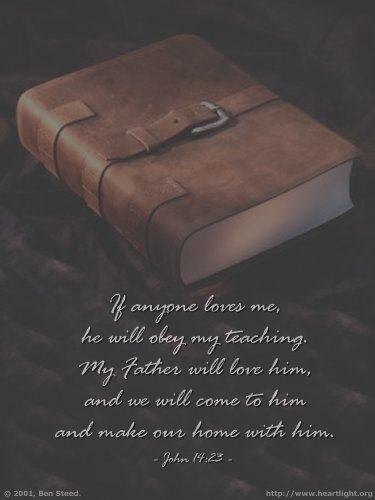 Well, if we are wondering how on earth we can possibly obey Jesus' teachings, He graciously answers this for us in the next two verses in today's readings: "And I will ask the Father, and he will give you another Counselor, who will never leave you. He is the Holy Spirit, who leads into all truth. The world at large cannot receive him, because it isn't looking for him and doesn't recognize him. But you do, because he lives with you now and later will be in you." Basically, we cannot obey Jesus' teachings on our own. Using our own will power or smarts or strength, we will fail. We need the Holy Spirit, living with in us, to give us the grace and strength to obey Jesus' teachings. The Holy Spirit rounds out the Trinity and leads us and guides us. Are you looking for the Holy Spirit? Do you recognize the Holy Spirit living within you? Do you believe the Holy Spirit is leading you into all truth? Verse 27 is a beautiful teaching from Jesus: ""I am leaving you with a gift--peace of mind and heart. And the peace I give isn't like the peace the world gives. So don't be troubled or afraid." 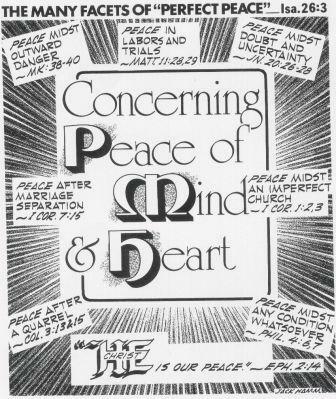 Have you received the gift of peace from Jesus? Do you have peace of mind and heart? Bible.org's commentary on today's John readings today titled "Having a Friend in High Places" is at this link. Today in Psalm 119 verse 37 we read: “Turn my eyes away from worthless things; preserve my life according to your word.” Are there currently things in your life that you are spending time on – focusing your eyes on – that are worthless? What are these things? Do you want to turn your eyes away from these things? Will you? Do you believe that your life can be preserved by the Word of God – the Bible? How will you continue to preserve your life according to God’s Word on a daily basis? Do you consider the Bible literally to be a "life preserver" for you in the midst of the raging rivers of life? Will you hold onto this life preserver each and every day? Proverbs - Wow... how powerful is Proverbs 15 verse 33 today? - "Fear of the LORD teaches a person to be wise; humility precedes honor." 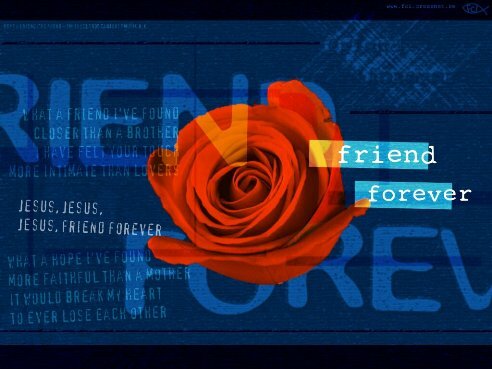 Worship God: Today's readings in Second Samuel 7 reminded me of Delirious' song "What a Friend I've Found:"
Is Jesus your friend? Click here and meet your best friend forever! Prayer Point: Pray that you have received the Spirit of Truth - the Holy Spirit - within you, through your faith in Jesus. Pray that you will love Jesus and keep his commands. Pray that you are rejoicing because the Holy Spirit lives with you and is in you today! Comments from You & Questions of the Day: Do you believe this Proverb to be true? 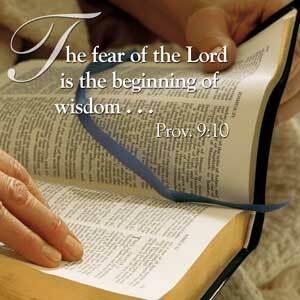 Does fear of God teach us to be wise? Why would humility precede honor? Also, what verses or insights stand out to you in today's readings? Please post up by clicking on the "Comments" link below! And I will ask the Father, and he will give you another Counselor to be with you forever— the Spirit of truth.....But you know him, for he lives with you and will be in you. Two verses to make note of regarding the Trinity. In first the Father will send "another" parakletos (called to one's side to be of help). Another is not different in Greek but of a "similar kind". Jesus and Holy Spirit are of a similar kind as part of the Trinity. Not to just be "with you forever", but abide with you forever. The Spirit ("pneuma") refered to in the Old Testament as the "Spirit of God". Doesn't sound like Spirit will ever leave you in this verse. The Spirit of Truth because God is Truth. Jesus is Truth. "Before Pentecost, the Holy Spirit came upon men and dwelt with them. But since Pentecost, when a man believes on the Lord Jesus, the Holy Spirit takes up His abode in that man’s life forever." 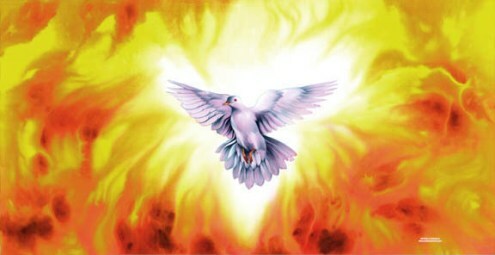 In the fuuture the Holy Spirit will be in you - The "in you" referred to in NIV is that Gk. word "en" that has the meaning of being immersed, enmeshed, intertwined with you. Pretty cool! In John 14:26 the Trinity is broken down again Holy Spirit, Father, and Jesus. Note the teaching denoted here is a "complete teaching". Mark down that in this first reference to "complete teaching" Holy Spriit will deal with the "past". What Jesus said, how it refers to Old Testament, and the Old Testament itself.